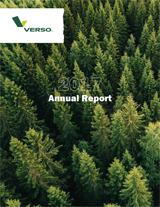 Verso's net sales for the second quarter of 2016 decreased $148 million, or 19%, due primarily to weaker than expected demand, continued pricing pressure, impact of Wickliffe mill closure and downsizing of the Androscoggin mill, and imports. Net loss of $33 million for the second quarter of 2016 was impacted by $19 million of Restructuring charges and Reorganization items, net. "We are confident that our prior operational excellence and continued products innovation enable us to successfully compete even in a very challenging environment," said David Paterson, Verso Chairman, President and Chief Executive Officer. "We are moving forward with a sense of urgency, a stronger balance sheet, and a renewed commitment to make Verso a much stronger company." Net sales for the second quarter of 2016 were 19% lower than the second quarter of 2015. Our sales decline was primarily driven by a 17% decrease in total sales volume due to the general softening of demand for coated papers, our capacity reductions at our Androscoggin mill, and the closure of our Wickliffe mill. Selling, general and administrative, or "SG&A," expenses decreased by 13% compared to the same period of the prior year, primarily as the result of synergies achieved from the NewPage acquisition. As a percentage of sales, selling, general and administrative expenses were flat quarter over quarter. Restructuring charges were $7 million for the second quarter of 2016. Restructuring charges for the second quarter of 2016 consisted primarily of severance and benefit payments related to the closure of the Wickliffe mill. Reorganization items, net for the second quarter of 2016 was an expense of $12 million, primarily attributable to professional fees directly associated with our bankruptcy proceedings, or "Chapter 11 Cases." Net sales for the first half of 2016 were 17% lower than the first half of 2015. Our decline in sales was primarily driven by a 15% decline in total sales volume. The decline in volume was primarily due to the general softening of demand for coated papers, our capacity reductions at our Androscoggin mill, and the closure of our Wickliffe mill. SG&A expenses decreased by 14% compared to the same period of the prior year, primarily as a result of synergies achieved from the NewPage acquisition. As a percentage of sales, selling, general and administrative expenses were flat year over year. Restructuring charges were $151 million for the first half of 2016. Restructuring charges for the first half of 2016 consisted primarily of non-cash fixed asset write-down charges from the closure of the Wickliffe mill. Other operating income for the first half of 2016 was $57 million and was primarily attributable to the sale of hydroelectric facilities in January 2016. Reorganization items, net for the first half of 2016 was a gain of $36 million. Reorganization items, net represent expenses and income directly associated with our Chapter 11 Cases. Reorganization items, net also include adjustments to reflect the carrying value of liabilities subject to compromise at their estimated allowed claim amounts, as such adjustments are determined. The adjustment of the carrying value of our debt to the estimated allowed claim of its stated principal balance resulted in a net non-cash gain of $81 million. The Company expects sales to increase in the seasonally strong third quarter versus the second. Capital and maintenance spending will be higher due to planned maintenance outages, especially a major boiler re-build at our Wisconsin Rapids Mill. Capital spending for the year is expected to be $75 million, well under the prior published plan of $100 million. The Company continues on its consolidation plan with a common order management system scheduled to begin implementation in the fourth quarter. This is the first phase of investment in systems to consolidate and better manage the Company and related SG&A costs. EBITDA consists of earnings before interest, taxes, depreciation, and amortization. Adjusted EBITDA reflects adjustments to EBITDA to eliminate the impact of certain items that we do not consider to be indicative of our performance. We use EBITDA and Adjusted EBITDA as a way of evaluating our performance relative to that of our peers. We believe that Adjusted EBITDA is an operating performance measure commonly used in our industry that provides investors and analysts with a measure of ongoing operating results unaffected by differences in capital structures, capital investment cycles, and ages of related assets among otherwise comparable companies. For 2016, charges are primarily associated with the closure of the Wickliffe mill, of which approximately $137 million is non-cash. For 2015, charges represent severance and employee related costs and other restructuring charges associated with the NewPage acquisition, the shutdown of a pulp dryer and paper machine at the Androscoggin mill, the indefinite idling of the Wickliffe mill, and the closure of the Bucksport mill. Professional fees and other charges and integration costs incurred in connection with the NewPage acquisition, including one-time impacts of purchase accounting. Expenses and income directly associated with the Chapter 11 Cases, including $116 million of non-cash reorganization gain recognized in the first quarter of 2016 for the difference between the petition date carrying value of certain Verso notes previously recorded as a troubled debt restructuring and their par value (estimated allowed claim) for such debt. Costs incurred in connection with advisory and legal services related to planning for the Chapter 11 Cases. Realized losses (gains) on the sale of fixed assets, which are primarily attributable to the sale of hydroelectric facilities in January 2016. Amortization of non-cash incentive compensation, unrealized losses (gains) on energy-related derivative contracts, Wickliffe operating costs while idled, and other miscellaneous non-recurring adjustments. Verso will host a conference call on Tuesday, August 16, 2016 at 10 a.m. (EDT) to discuss second quarter 2016 results. Analysts and investors may access the live conference call by dialing 888-317-6003 (U.S. toll-free), 866-284-3684 (Canada) or 412-317-6061 (international) and referencing Verso Corporation. To register, please dial in 10 minutes before the conference call begins. The conference call and presentation materials can be accessed through Verso's website at http://investor.versoco.com/ by navigating to the Events page, or at https://www.webcaster4.com/Webcast/Page/1524/16673. This release and Verso's quarterly report on Form 10-Q for the three months ended June 30, 2016, will be made available on Verso's website at http://investor.versoco.com/ by navigating to the Financial Information page. A telephonic replay of the call can be accessed at 877-344-7529 (U.S. toll-free), 855-669-9658 (Canada) or 412-317-0088 (international), access code 10091355. The replay will be available starting at 12 p.m. (EDT) on Tuesday, August 16, 2016, and will remain available until September 15, 2016. An archive of the conference call and webcast will be available at http://www.versoco.com starting at 12 p.m. (EDT) Tuesday, August, 16, 2016, and will remain available for 120 days.